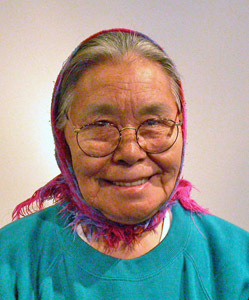 Born in 1938, in Sarollie’s Camp, near Inukjuak. “I started [dollmaking] when I was a little girl. I made one small doll a long time ago . . . using a white stone from the seashore to make the head. . . . When I made that doll, it brought four dollars, for which I bought lots of perfume. I was so happy that I kept on making dolls. That was my first accomplishment in sewing” (Inukpuk in Inukpuk-Iqaluk 1996:11). Inukpuk was influenced by her mother, who made dolls for her, and who she watched making kamiks. Inukpuk sews, using animal skins, fur, grasses, cloth, beads, and stone. Inukpuk has made dolls from cloth, tanned caribou skins, and sealskin. She initially incorporated stone heads that her husband, Charlie, carved out of stone, but, after he retired from carving, she started making the doll heads herself. She also makes bases for her dolls, usually out of woven grass. “In the spring, I make the grass bases on which the dolls stand. That is the time when the grass is good and I prepare it before receiving any orders. I do more grass weaving in the spring and make the dolls in the fall. I put heavy items on the finished grass base because it is flexible and tends to get lopsided when left alone. It has to be stored safely” (Inukpuk in Inukpuk-Iqaluk 1996:12). She says that when she finishes a doll “it literally becomes a person. That’s the part I like best. . . . When I finish the dolls and take photographs of them, I laugh because I am so happy to be finished” (ibid.). Some of Inukpuk’s dolls imitate day-to-day activities, such as drying skins, stretching kamiks, and hunting, while others are characters from stories, such as Kautajajautjuk, a legendary orphan boy who was treated badly by people, but sought revenge when he grew older, and an old woman who killed a polar bear by stuffing her mittens in its mouth (Inukpuk in Inukpuk-Iqaluk 1996:11). After winning a pair of doll making prizes at the Crafts from Arctic Canada competition in Toronto in 1974. Inukpuk participated in the Pan-Arctic Women’s Workshop at the Ottawa School of Art in 1998, and has travelled to other communities in the North to teach dollmaking. 1996 “I enjoy dollmaking immensely,” Inuit Art Quarterly (IAQ), vol. 11, no. 4 (Winter): 10–13. 1998 “Elisapee Inukpuk,” Inuit Art Quarterly (IAQ), vol. 13, no. 1 (Spring): 12.